Is Bioweapon Defense Mode a tone of voice triumph? Have you ever sat in miles of smoking traffic and wondered how much crap your lungs are taking in? With all the recent news on air pollution, working with our client the British Lung Foundation, and having been diagnosed with Bronchiectasis, air pollution has been on my mind lately. I was on my way back from a fun couple of days training TalkTalk’s social media teams this week. And I was inching my way through another monstrous Manchester rush hour, wondering how much rubbish my car was actually keeping at bay. It got me thinking about a great tone of voice example – Tesla’s naming their air filtration system the Bioweapon Defense Mode. Can you imagine BMW calling theirs that? Or Ford? 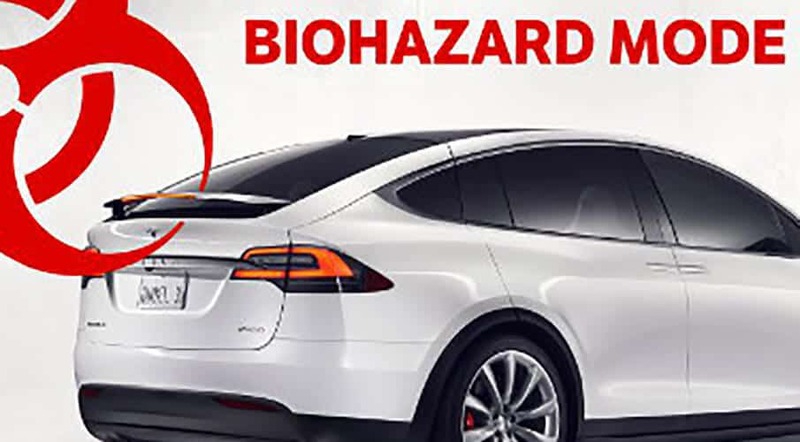 Like its Ludicrous Mode, Bioweapon Defense Mode is just one way Tesla is standing out and frightening the rest of the industry. I drove a Model S a while back, and it felt like driving the future. A massive 17″ screen dominates the dash. And now we’re so used to swiping and prodding a screen to get things done, it makes more intuitive sense than knobs and dials. But back to chemical warfare defence. Tesla claim their HEPA filtration system is so effective, it doesn’t just clean the air inside the car, it starts cleaning outside, too. And that’s why I think it’s such a good example of tone of voice. We argued in Brand tone of voice: is it the icing on the cake, or is it the cake?, that you can’t just plaster tone of voice over a shoddy product or service. It might win you more customers in the short term. But they won’t stay once they experience the reality. Brand language only works when the underlying brand, culture, product and service are all in tune with each other. In Tesla’s case, they’re using their tone and naming to tell a great story. Bioweapon Defense Mode tells me their air filtration is probably the best in the business. Ludicrous Mode gives you the kind of acceleration you only get in electric cars. And if you’ve seen the YouTube videos, you know it really is ludicrous. Each name adds to the story. They’re evocative, paint a rich picture and, more importantly, make it easier to tell Tesla’s story to friends. If you make your story easy to tell, people are more likely to tell it, aren’t they? Read more on Tesla’s Bioweapon Defense Mode.